While Cinco de Mayo is long since over, there’s another upcoming holiday that provides you a perfect excuse to indulge in Mexican cuisine and cocktails! Guacamole Day on Sept. 16 celebrates all things avocado. 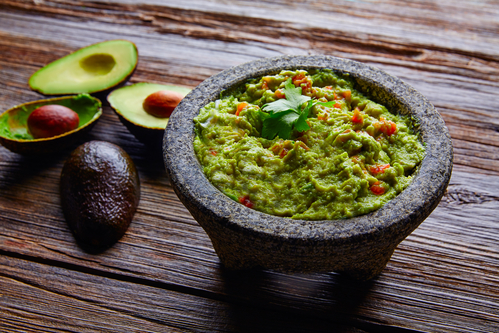 While it may not be an official holiday, it’s a great reason to get out and about around your Canvas Valley Forge apartment, as the area is home to lots of authentic Mexican eateries where guacamole is a staple. Whether you sample a bit from each on a restaurant crawl or hunker down at one spot for a night of tasting and tequila, don’t let this occasion pass without honoring it! Cantina Laredo: Traditional Mexican dishes with modern twists are at the center of the menu at Cantina Laredo, 1.5 miles from your Canvas Valley Forge apartment. The eatery bills its guac as “top shelf”: It’s made fresh right at your table with avocados, jalapeño, veggies, cilantro and lime juice. If you really want to get creative, opt for the queso and guac combo, featuring the best of both worlds! Plaza Azteca: Made fresh tableside, the guac at Plaza Azteca, one mile from your Canvas Valley Forge apartment, will transport you straight from King of Prussia to Mexico. Go for the traditional version or, if you want to spice things up a bit, try the grilled pineapple guacamole, which comes with the fruit along with veggies, goat cheese and more. Buena Vista: While Buena Vista, about three miles from your Canvas Valley Forge apartment, has a reputation for its authentic Mexican cuisine, its homemade guacamole is among its standout dishes that define the restaurant’s taste. The eatery makes each batch to order, with the freshest lime juice, avocado and veggies around, giving it a light feel and taste. And with a full menu featuring traditional Mexican staples and some off-the-beaten-path bites, you’ll definitely leave satisfied.